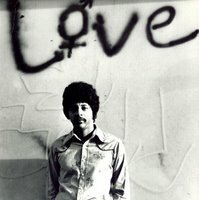 Arthur Lee, lead singer, guitarist and principle songwriter for the seminal Sixties Los Angeles rock band Love, has passed away at the age of 61, succumbing to acute myeloid leukemia. It's impossible to understate the importance of Lee's work with Love during that critical time; in a time where it was the norm for white bands to adapt black American musical traditions, Lee, an African American, took on the guise of a "black hippie" and embraced English British rock in the guise of the Stones and the Beatles, and he wasn't above blending it with a surreal smattering of MOR vocal stylings. As a vocalist , he was a unique and brilliantly transperent , alternating between a Mick Jagger glottal, semi-Delta moan and grunt, and the honey-toned tenor of Johnny Mathis. It was genius, intended or otherwise, that he would assimilate the influence of a British singer who made a career emulating black American soul singers, and a popular black singer who crooned with out a trace of racial signifiers other than the "good music" expectations desired by a broad, mostly white audience. was short lived; drugs, jail, eccentricity and erratic behavior prevented him from regaining the heights he reached with Forever Changes.There are very, very few rockers, though, who have the bragging rights to being the creator to such a masterpiece. Rock on, Arthur. Hey shann!! Good to see you. This guy's quieter stuff reminds me of that old noir film WHO ELSE KNOWS YOU'RE HERE?, the one with the woman obsessed with silver wigs and stuffed canaries. It gives me the creeps every time I watch it, which is often. I thought this would be a good place to mention that High Moon Records has finally released Love's 1973 album BLACK BEAUTY. This record sounds of its time -- there's plenty of fuzzed-out guitar and gnarly diesel-stained blues-rock grooves -- but if you like Lee there's flashes of genius here worth hearing. There's Hendrix-style spacy love ballads, broody garage-rock, a calypso styled tune and even a twangy cover of the Serendipity Singers' "Walk Right In." Lee is in fine voice and sounds like he means it. The album is raw-boned, a little weird and gentle in unexpected places -- in other words, the sort of record Lee made when he was on his game. Worth seeking out.